Comparo : Royal Enfiled classic 500 vs Royal Enfiled classic 350? Whenever a new Royal Enfield rolls out of the factory, for the audience outside the ‘Bullet’ cult, it’s just another iteration of the same old thumpers that the world has gotten used to seeing in the last few decades. Engine : Royal enfield classic 500 cc comes with Single Cylinder, 4 Stroke, OHV, SI Engine, Aircooled, fuel injected engine where as royal enfield classic 350 cc comes with Single Cylinder, 4 Stroke, OHV, SI Engine, Aircooled, Twinspark engine. Fuel System : classic 500 comes loaded with most technologically advanced Electronic Fuel Injection (EFI) manufactured by kehien, japan (also used by honda motors) whereas classic 350 cc comes with old (but tested) carburetor technology. Carburetor ? The goal of a carburetor is to mix just the right amount of petrol with air so that the engine runs properly. If there is not enough fuel mixed with the air, the engine "runs lean" and either will not run or potentially damages the engine. If there is too much fuel mixed with the air, the engine "runs rich" and either will not run (it floods), runs very smoky, runs poorly (bogs down, stalls easily), or at the very least wastes fuel. The carb is in charge of getting the mixture just right. EFI ? The EFI system replaces the carburetor and is actually a much simpler device. It consists of an injector unit, a throttle body, a computer, and several sensors. The sensors relay information to the computer which then tells the injector device how much fuel to put into the cylinder and the throttle body how much air to insert at any given time. This allows the bike to create bike a perfect, predictable mixture. The sensors measure the engine temperature, oxygen in the exhaust stream, crankshaft position, manifold pressure, and throttle position. These sensors feed data to the computer and it, in turn, controls the precise air-fuel mixture. The result is more reliability, better driveability, improved fuel economy, lower maintenance, and a cleaner-running engine. Maximum power : The 500 cc model produces 41.3 Nm of pure torque and 27.2 bhp, lending the bike a feel best understood when experienced. The sense of power you derive from “The Monster” is absolutely unbelievable. On the other hand classic 350 twinspark engine churns a maximum power of 19.8 bhp at 5250 rpm while it generates peak torque of 28Nm at 4000 rpm. Both bikes are provided with five speed gearbox with left side gear shift. The gearbox follows 1-N-2-3-4-5 pattern. Both the variants have self and kick start option. Ignition system : classic 500 comes with electronic ignition whereas classic 350 comes with digital tci system. Dimensions : The overall length, height and width of Royal Enfield Bullet Classic 500cc are 2130mm, 1050mm and 800mm respectively while Royal Enfield Bullet Classic 350cc length is 2150mm, height 1080mm and width is 800mm. The wheelbase(1370mm), saddle height (800mm) and ground clearance (140mm) are same in both the machines. Tyres : The Royal Enfield Bullet Classic 500cc and 350cc sports bigger tyres with multi spoke rims. Both the tyres, rear and front, are zapper type (manufactured by MRF india) that reduce the chances of skidding. The specifications of the front and rear tyres are 90X90-19 and 120X80-18 respectively. Royal Enfield Bullet Classic 350cc has front tyre of 3.25-19 and the rear tyre is 110X90-18. Only the rear tyre is a zapper. Wheelbase for the both the machines is same that is 1370mm. Available Colors options : The siblings are available in three attractive body colours. 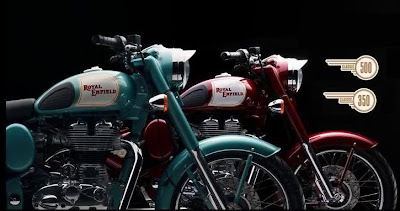 Royal Enfield Bullet Classic 500cc comes in red, black and sky blue (strangely called green color by company) while Royal Enfield Bullet Classic 350cc is available in red, black and silver shades. It means that red and black shades are common whereas sky blue/green shade is a standard colour for Classic 500cc. Silver comes in only Royal Enfield Bullet Classic 350cc. In both the new products, body colour is there on front and rear fender, fuel tank, mask, air filter box and utility box. Engine, silencer, rear fork, rear view mirrors and legguard are in chrome for both motorcycles. But hey there is a catch, royal enfield classic 500 has body colored chassis whereas The smaller twin of the Classic 500cc has simple black colored chassis !! Mileage / Average / Fuel Economy : As far as fuel efficiency is concerned, the younger sibling of Classic bikes scores over the elder. Royal Enfield Bullet Classic 500cc gives, according to local brand showroom of RE, 32-35 kmpl of mileage with electronic fuel injection system while Royal Enfield Bullet Classic 350cc is supposed to give 40-45 kmpl of fuel economy. Low fuel efficiency of Royal Enfield Bullet Classic 500cc is mainly due to higher engine capacity of the bike. On the other hand, Royal Enfield Bullet Classic 350cc gives more mileage on account of unit construction engine and lower engine capacity as compared to Royal Enfield Bullet Classic 500cc. more sense and is also a more fun bike. On Road Control and handling : For active and passive safety, enough tools are there in Royal Enfield Bullet Classic bikes. To name a few, front disc brake and gas filled shock absorbers are fitted in the new machines. As the bike is blessed with widest wheelbase, balance while driving and grip on road would be awesome. Under the rider's seat, Roll over Sensor is fitted that works in a case of accident or skidding (only on classic 500). The Roll over Sensor will switch off ignition and cut off fuel supply that will prevent the motorcycle from moving suddenly if it is in gear. Design &amp;amp; Build Quality : On the first glance, Royal Enfield Classic 500cc looks like it is original Bullet from 1950’s, it’s that similar! But when you come closer, you will see that it is a blend between vintage motorcycle and modern generation bike. Both classic 500cc and classic 350cc share same design over sized mudguards, “teardrop” tank, single saddle seat and covered headlamp.There was even a new logo of Royal Enfield on the top of the fuel tank – Cannon with words imprinted “Made like a gun”. Some other details that I like, are vintage- looking springs used for suspension and riding seat. Just like from 1950’s, and this classic look is timeless. Especially I like the old-school taillight looks; it has a round shape which makes it look historical, really great touch. Chromed parts look impressive – shiny and polished. Weight : classic 500cc has a kerb weight of 187 kg (with 90% fuel &amp;amp; oil) whereas classic 350cc is on a bit lighter side with 182 kg (90% fuel &amp;amp; oil). Price : Classic 500cc is almost 28% more expensive than classic 350cc. Classic 500cc is priced at whopping Rs 1,50,000 on road new Delhi and classic 350cc is priced at Rs 1,18,000 on road new Delhi. You don't mind spending 28 % premium for classic 500cc. you are going to use the bike mostly for "real motorcycle touring"
You are looking for a modern bike (EFI and all that stuff) with a tinge of classic-ness to it. 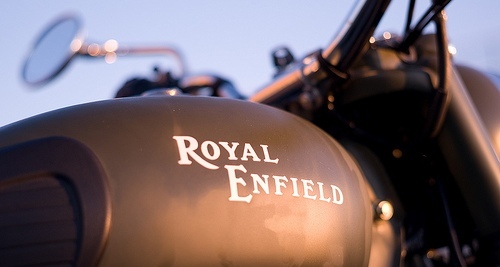 you are a true motorcycle lover and a royal enfield fan !! You are expecting a higher fuel efficiency. you want a value for money deal. you are looking for no nonsense motorcycle. Since it doesn't have complex efi system which means less headache (if by chance efi system fails). you want a cheaper alternative to classic 500cc (looks) . Royal Enfield C5 is a better bet. well written!!! i hav one question that if i remove baffles/filters frm the exhaust to make it louder...will it affect d mileage,performance etc.? @Veer it might affect in C5 as it has sensors attached to it. However on Clasic 350, won't have any adverse effect. I'd recommend to get yourself a new silencer coz the silencer you get with the bike has a special expensive filters. @veer my friend has changed the exhaust and he is happy with it. And yeah mileage isn't affected atleast in his case.